In the center of this landscape is a massive church, made in bright colors. The contours of the building are drawn more clearly than the rest of the designs from Renoir’s canvases. In this case, the bends and depressions are not transmitted using alternating dark and light strokes, but using more detailed rendering. The white building has a slightly pinkish tint, and the roof is bright red. At the top of the roof is a cross, which tells about the nature of the structure. The darkest components of the structure are two depressions: one narrow window and wide to accommodate a massive bell. Most of the building covers the tall and dark wood, which takes on most of the attention. Among the overall composition, made mainly in light shades, the tree is the darkest and most massive figure. The texture of the leaves is not worked out, more attention is paid to the shape of the crown. Crohn has blotches of yellow and white, although it consists mainly of green and black, emphasizing the recesses and bends of the foliage. The top of the tree is sharp and directed straight to the sky, in the shape of a candle flame. In front of the building is a group of people. Among the figures you can discern a young woman talking to two people. Their clothes are made in light gray shades, however, the orange headdress of the woman stands out in part of the composition. In the right side of the composition are several trees of unnatural shape. The strangeness lies in the fact that they consist only of curved thin stems. The presence of such unusual vegetation gives the canvas a touch of non-standard and mysticism. 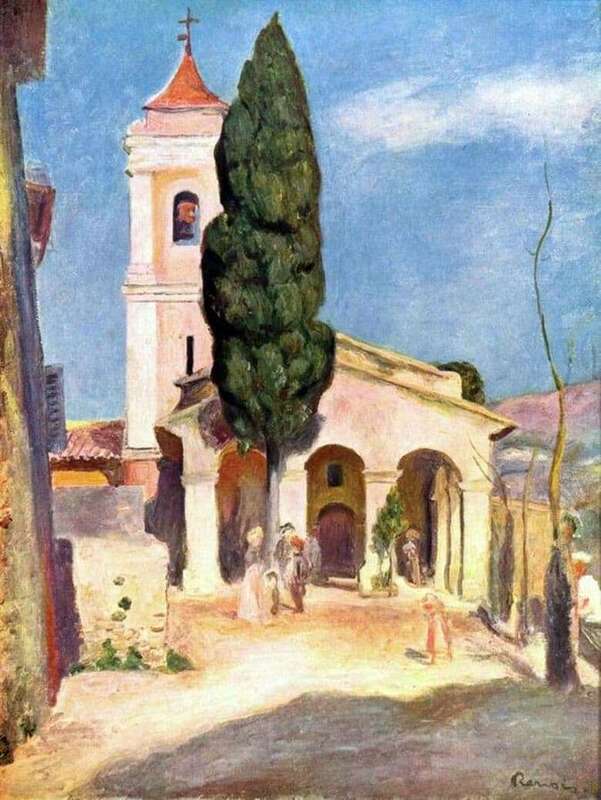 The picture was painted on a sunny day, so the play of light and shadows coming from buildings and trees gives liveliness and realism to the work.